Hurghada . Sharm El Sheikh . El Gouna . Marsa Alam . Activities . Egypt . Dahab . Attractions . Egypt is rightfully famous for its phenomenal history and culture: Ancient pyramids, the Sphinx, and seemingly endless temples dotting the Nile. But have you ever considered choosing Egypt for your next relaxing beach holiday? Outside the hustle and bustle of Cairo, there are plenty of places where life unfolds at a slower pace. You’ll find pristine shorelines, top-notch spas, comfortable resorts, and opportunities to enjoy water sports. Here are the top 5 places to visit in Egypt if you’re looking to unwind. Marsa Alam is where to go when you truly want peace and quiet. This sleepy town has been growing in popularity among tourists lately, but it still makes an excellent beach escape. Go diving or snorkeling in the warm Red Sea waters, or simply relax with a book. 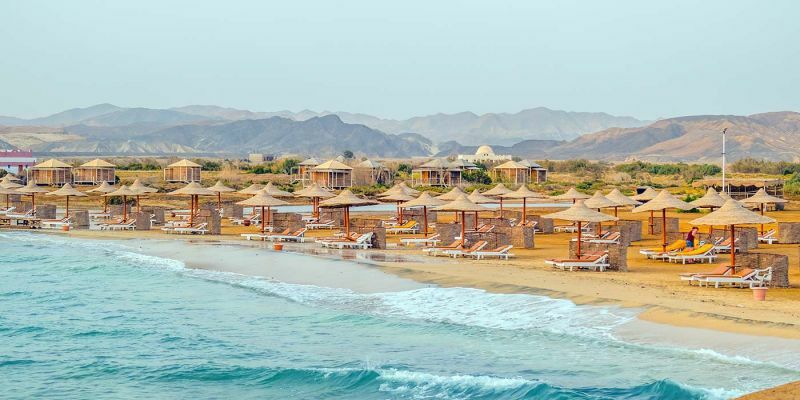 If you’re feeling more ambitious, you can use Marsa Alam as a base from which to visit Egypt’s Eastern Desert and the beautiful Wadi el Gemal National Park. 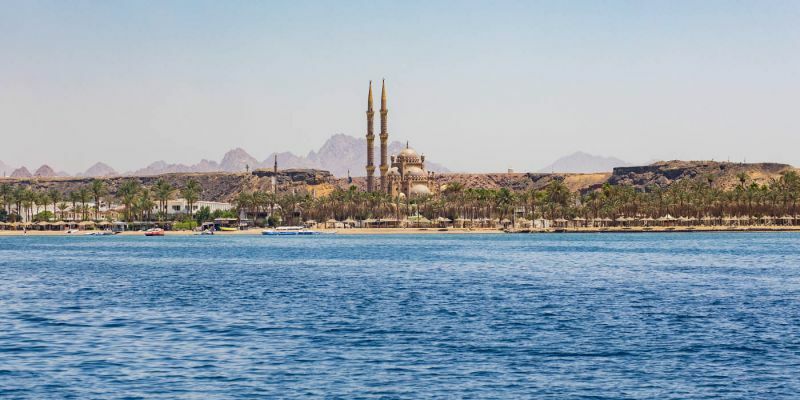 Finally, Marsa Alam is relatively close and well connected to Luxor and the temples at Karnak and Edfu, so you can combine your beach getaway with some historic sightseeing too. Incredible beaches and unforgettable dive sites: This combination brings thousands of visitors to Hurghada and for good reason! Hurghada offers a truly dizzying array of activities. You can of course go SCUBA diving or snorkeling for close-up views of coral reefs and marine life. You can also opt for a glass-bottom boat tour to catch a glimpse underwater without getting wet. Other options include windsurfing and taking a boat cruise to explore the nearby Giftun Islands. On land, you’ll find plenty of ways to relax and entertain yourself as well. Enjoy an evening browsing Hurghada’s shops and trying one of its restaurants. Consider heading into the desert for a completely different landscape. Like Marsa Alam, Hurghada is only several hours away from Luxor, so you can visit some famous temples on the same trip. Situated about a 30-minute drive away from Hurghada, the resort town of El Gouna is a smaller, quieter alternative, though make no mistake: El Gouna still has plenty to do! You can enjoy virtually any water sport here, from SCUBA diving and snorkeling to windsurfing. 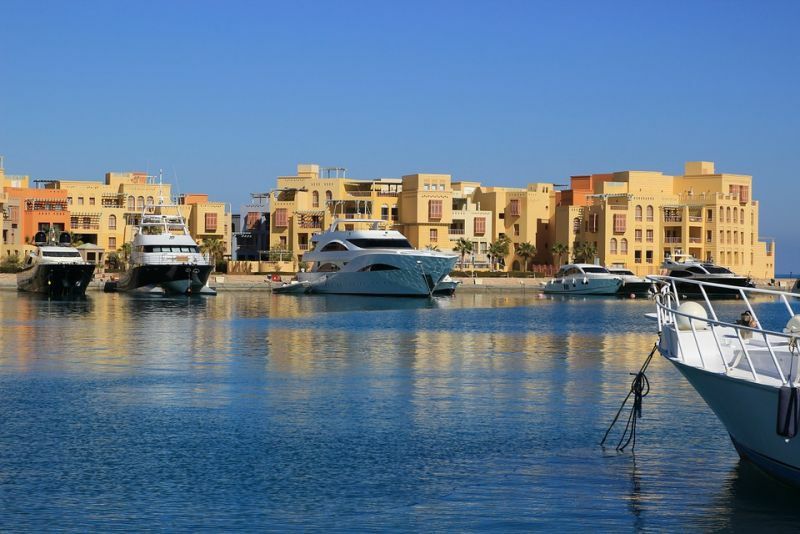 Numerous boat cruises depart regularly from El Gouna’s shores. Accommodations here tend to be upscale, and there are also excellent spas, fine dining, shopping, and even a small museum. El Gouna is ideal if you’re hoping to enjoy horseback riding, tennis, or golf during your vacation, since it has facilities catering to all of these sports. Overall, this Red Sea resort town will most likely have you never wanting to leave. Perched on the southern coast of the Sinai Peninsula, Sharm is perhaps best known as a world-class dive spot. Its calm and crystal clear waters, along with its warm weather, make it an ideal setting for all kinds of water sports. Don’t miss out on Ras Mohamed Nature Reserve, a protected area with stunning beaches, mangroves, and coral reefs. If you’re a diver, check out the wreck of the SS Thistlegorm, one of the world’s most fascinating wreck sites, and an excellent place to find barracuda, lionfish, stonefish, moray eels, and other species. In addition to all the underwater activities, Sharm provides numerous land-based activities, ranging from go-karts to quad biking to horseback riding. I also highly recommend taking a trip into the desert to see the famous Mount Sinai and St. Catherine’s Monastery. Between the breathtaking desert landscape and the ancient history, this excursion is unforgettable. 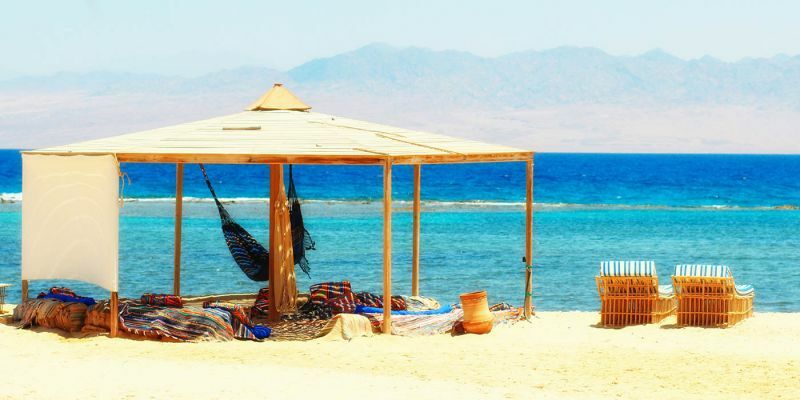 Located on the Gulf of Aqaba, about 50 miles north of Sharm, Dahab is a charming and relaxed beach town known for SCUBA diving, free diving, snorkeling, windsurfing, kayaking, and other water sports. Plus, you can find yoga classes, rock climbing excursions, and sandboarding. 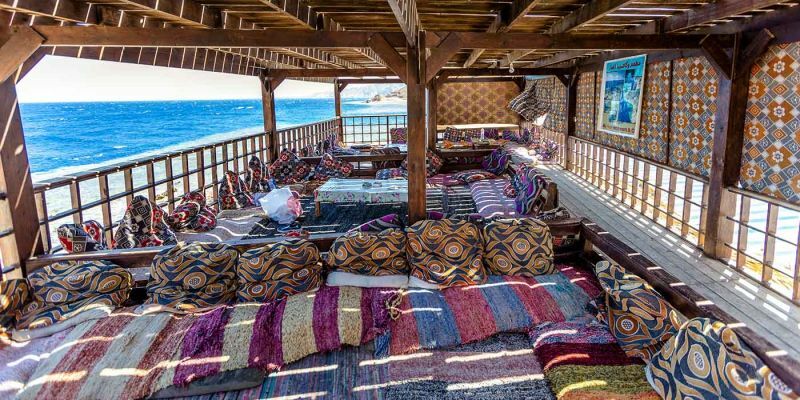 Once a small Bedouin village, Dahab has become popular with hippies and adrenaline seekers alike. In any case, the beautiful beaches here are equally good for relaxing and napping as they are for partaking in more exhilarating pursuits like free diving. While in the area, you might also want to book a tour into the desert or a trip to Mount Sinai and St. Catherine’s Monastery. These five laidback destinations are the perfect places to kick back and do, well, nothing at all. They combine a wide range of leisure activities with gorgeous coastal scenery, fascinating culture, and warm weather. Whether you’re looking for a lively hotspot or a sleepy town, this list has you covered. As an added bonus, all of these destinations can serve as bases for trips into the desert and to incredible historic sites like Karnak or St. Catherine’s. But even if you never leave the beach, you’ll be treated to some of the best marine life, water sports, and picturesque coastline the world has to offer. Egypt is a rich country is history and culutre, have you ever thought of egypt as an ideal destination for your next holiday beach, know more about Egypt travel packags where you can combine the relaxing beach holiday with classical tours!